Dual language programs are on the rise in the USA, with at least 39 states currently offering classes to students. This number has risen rapidly in the last decade, but these programs are still not as widespread as one might think, given their well-documented and numerous benefits. At Participate Learning, we’ve seen the many advantages of dual language programs in practice among educators and students across the U.S. In this post, we’ll describe some of the benefits in detail. Having to mentally juggle more than one language is a challenging activity but one that brings plenty of rewards later in life. Neuroscience research has shown that studying a second language increases brain density and cognitive skills, as well as protecting against Alzheimer’s and other cognitive impairments. These cognitive benefits lead to improved working memory and increased attention, as well as a boost to problem-solving abilities for students. These are skills that are not only useful for learning a second language – they are essential to a student’s education as a whole, as well as their future careers. Dual language programs may also act as a signal to colleges and universities that these students have not only excelled academically but have done so with the added challenge of learning another language at the same time. In fact, bilingual adults tend to have higher average salaries and greater career opportunities than people who speak only one language. Learning a new language is about far more than just acquiring new vocabulary; it gives students a better understanding of a new culture. They will learn about everything from societal norms to history and local cuisine along the way. Language allows us to understand each other in everyday interactions but also gives us insights about the culture of a country and its people. 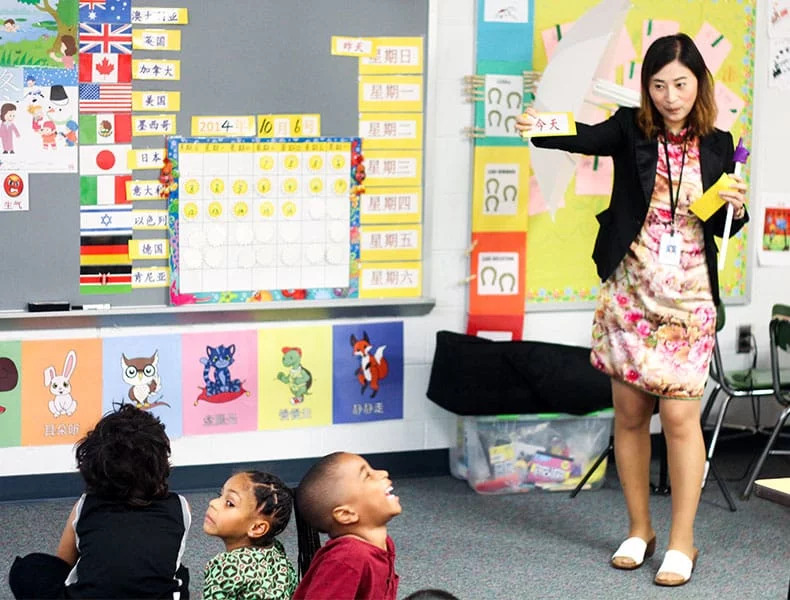 Educating students to be more culturally aware through dual language programs has the additional benefit of teaching them about global citizenship. It will show students other cultures outside of their own experiences, and help them to become more curious and empathetic about the wider world and people from different backgrounds. Aside from the ability to communicate in more than one language, the skills involved in learning a new language will also have secondary benefits to a student’s native tongue. Mastering a new language improves a student’s communication skills and helps them understand more about how language works. They are reaffirming the abilities they learned as infants when acquiring language skills for the first time. They are essentially learning how to express themselves in new ways: how to form sentences, which words to use, and how to be clear and understandable to their audience. They will also gain confidence in their ability to speak in public, whether that’s in their second language or their first. Language is at the very core of our identity: it’s how we relate to our past, our family, our culture and our upbringing. It’s important to remember that while dual language programs teach students a new language, they do so while also building upon their native one. There is enormous value in retaining a strong grip on one’s identity. It is a huge boost to self-esteem and helps students remain connected to their own culture even while they experience a new one. Dual language education empowers students as well. Becoming bilingual allows students to strengthen their voice in their first language. At the same time, they develop a voice in their second language. Finally, dual language programs are vastly different from the methods by which a student would normally acquire a new language. Students are not taking a class specifically to learn a new language in small increments. Instead, they master that language while learning science, math, social studies and language arts at the same time. They also use the language to develop relationships with peers and teachers. In other words, students use language in relevant and real-world ways. For example, in a dual language classroom, students might engage in a hands-on science lesson in the target language. In this way, learning becomes even more purposeful and relevant to students. They will become more invested and motivated to achieve academically while learning a new language at the same time. To learn more about bilingual education download this infographic or watch this video.